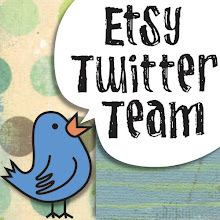 Every Tuesday, Etsy NJ Street Team hosts a Blog Hop! Each week, those of us who blog, pick a fellow member of our team to showcase, then you can follow the links to read about other extraordinary team members. When you first enter the shoppe of Pancakeandlulu, you are just hit with these wonderful array of colors and textures. WONDERLAND handspun and handpainted gypsy yarn low impact dyes (see photo, left) is just one of the wonderful yarns I'm speaking about... just look at the combination of colors bursting out. something out of this~what, I don't know, but something!" 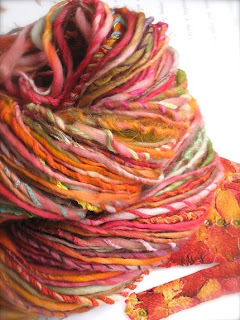 a beautiful handpainted bulky wool yarn. Gorgeous mustard yellow! 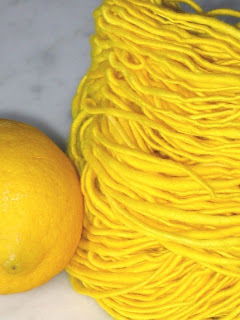 It reminds me of the best glass of lemonade, ever! "I think of my yarns as freestyle fiber "collage", each skein is a fun and unique work of art in itself. Use them for anything you desire", say's owner of Pancakeandlulu. 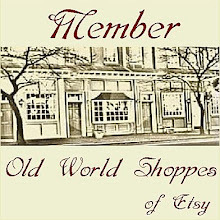 But wait, now she's opened another shoppe at Etsy ~ and I'm so certain she will get a sensation response to her newest venture, too! flapjackandpippin, opened in October of 2009 and it has a marvelous collection of felted juggling balls. 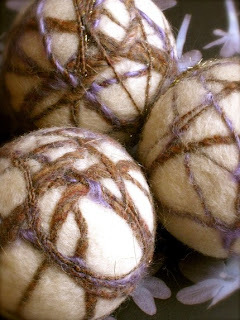 beautiful sheep's wool ball. a great toy for a child, pet or yourself! can be used as an ornament, pincushion or for crafting.